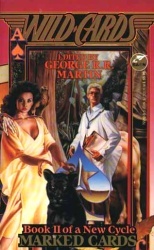 None of the volumes in this internal trilogy within the long-running Wild Cards series compared well with ealier installments. This third book was probably the best of the three, however. Unlike the first two – which were presented as a series of interlinked short stories threaded together with one longer narrative, this one is a genuine ‘mosaic novel’ – all the narratives of the different characters and writers are set out as one seamless text (disregarding section breaks). In this case, the text is divided into long chapters counting down from Eight to the story’s climax at Zero. One of the problems with the Card Sharks trilogy has been uneven character choice. In the first book, the main character was a pretty uninspiring arson investigator, a woman who wasn’t even a Wild Card victim. She is still present in the latter two books, but only as a minor character. In the middle book, a new character is introduced, and, in the context of that volume she’s pretty redundant, but in the final book she’s upgraded to main-character-hood. Unfortunately, she’s also quite whiny and her sections take up too much space. 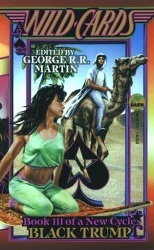 I think maybe one deeper problem with the three books (apart from the fact that the basic premise of the story involves a partial reboot of Wild Cards alternate history) is that they seem to have been envisioned as a way of tying up a bunch of loose ends – in particular, the Jumpers – aces who can swap their consciousness into the body of another person – and Gregg Hartmann, the one-time presidential candidate and secret ace Puppetman. It also leaves a big loose end hanging at the end, with one of the main characters suddenly deciding to be evil. And the covers of the books are crappy; that’s not a major flaw, of course, but a book’s presentation does influence the way you think of it. So now I’m faced with a quandary. The next book in the series, the sixteenth, is also the rarest, and will set me back about $100 to get hold of a copy. I’m not going to rush to buy it, but at the same time I do want to get up to date with the series, which appears to have found a new lease of life in the past few years. This is the fourteenth Wild Cards book and the second in an internal trilogy consisting of Card Sharks, Marked Cards and Black Trump. The first book wasn’t brilliant, being a disjointed, scene-setting, prequel-ish, rewriting of history sort of a story. This volume was better, though. Instead of being focused on the past, the narrative here moves forwards consistently as things actually happen in the story’s present. The story adopts the usual format of a number short stories/novellas alternating with an episodic narrative about one central character – in this case, former Senator, presidential candidate and ace, Gergg Hartmann – an important player in several of the earlier Wild Cards novels. This structure is generally effective and was, for the most part, in this book. However, the Gregg Hartmann sections tail off in interest towards the end. Most of the other stories are pretty strong, although, Sage Walker’s ‘A Breath of Life’, introducing a new and so far peripheral character, was fairly weak. The strongest part, I thought, was ‘Feeding Frenzy’ by Walter Jon Williams, where Croyd Crenson and Black Shadow embark on a mission to destroy the Card Sharks – with a fair amount of success. The general thrust of the story isn’t much altered by Crenson and Shad’s efforts, though and by the end, all Wild Card-infected people are facing grave danger in the form of a deadly virus. This sets the scene for a potentially thrilling conclusion to the trilogy – which will be much needed, frankly.